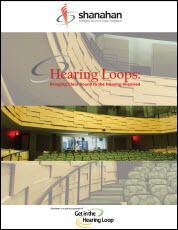 LOWELL, MA - January 24, 2012 - Shanahan, a leading sound and video service and installation company based in Massachusetts, has released a whitepaper entitled "Hearing Loops: Bringing Clear Sound to the Hearing Impaired". According to Catherine Shanahan, President of Shanahan, the company was inspired to publish the whitepaper to increase awareness of a relatively simple technology that is make an enormous difference to the hearing impaired. "This is technology that actually changes people's lives," Shanahan explains. "Thanks to a hearing loop, hearing impaired individuals can enjoy a movie or hear a presentation just as clearly as the rest of the audience." A hearing loop system delivers audio from a sound system directly to telecoil-equipped hearing aids and cochlear implants. The telecoil serves as an antenna to relay sounds directly into the ear without background noise. While hearing loops are commonplace in Europe, they have been slower to spread across the U.S. because, until recently, many hearing aids have not been equipped with telecoils. As telecoils become standard hearing aid attachments in the U.S., a campaign is underway to “loop” more public and private facilities. Download the white paper, and access additional information, at www.newenglandhearingloop.com.